If you’re the kind of person who enjoys action and is constantly on the move, and want to film your adventures in the best way possible, then you have every qualification to be a GoPro owner. In case you’re not familiar with what a GoPro is, we must mention that it’s the world’s most famous action camera. An action camera is a type of camera that you can take with you when you go surfboarding, snowboarding, and doing all sorts of activities where you wouldn’t dare to use your phone or another type of camera to film. If you’re interested in buying such an action camera, today’s review is going to be particularly useful to you. We’re going to look at the GoPro Hero 4 action camera and talk about some of its best features, and its pros and cons. The GoPro Hero 4 shoots 4K full frame, and its resolution is an impressive Ultra HD 3,840 x 2,160. But these aren’t the only shooting options you have. You can also choose to shoot with 2.7K at a resolution of 2,704 x 1,520, and with 2.7K 4:3 at a resolution of 2,702 x 2,028. The resolution settings on this GoPro are truly amazing, as it’s quite obvious from the examples above. You also have some high-speed options such as 1080p (1,920 x 1,080), 1,440p (1,920 x 1,440), or 720p (1,280 x 720). Another cool feature of the GoPro Hero 4 is the time lapse which you can control according to your needs, from 0.5 to 60 seconds. If you want to use your GoPro when you’re riding your bike (by placing it on your helmet) or when you’re in your car (by putting it on the dashboard), you’re free to turn on looping for a high-quality image and the possibility of multitasking while filming. With this mode, you don’t have to worry about the camera stopping because its memory is full. The new files will replace the old ones in case this happens. One of the most notable features of the GoPro Hero 4 is its SuperView mode, which is perfect for when you want to shoot wider frames. In this mode, the angle of vision is of 4K, 2.7K, 1080p and 720p. However, we must mention that the image will be a bit more distorted than what you would normally expect from a GoPro Hero 4. If you’re looking for a camera that allows you to take pictures while also shooting video, then you’ll be happy to hear that this GoPro allows you to take both time-lapse pictures and 12-megapixel pictures while filming at 1,440p, 1,080p, and 720p. Moreover, the burst mode allows you to take up to 30 shots per second. This 12-megapixel CMOS is an improved version of the GoPro Hero 3. If you’re wondering how you’re going to mount your GoPro Hero 4 in order to use it on your adventures, you should know that you have more than one mounting option. The adhesive bases you can use are both flat and curved, to fit any type of surface. You can also mount your camera with clips, which come in two different lengths, and add a link extender as well, in case you want the camera to rotate and capture a 90-degree view. The camera comes with two such extenders, that you can also use together, since they help you manufacture a pivot arm. 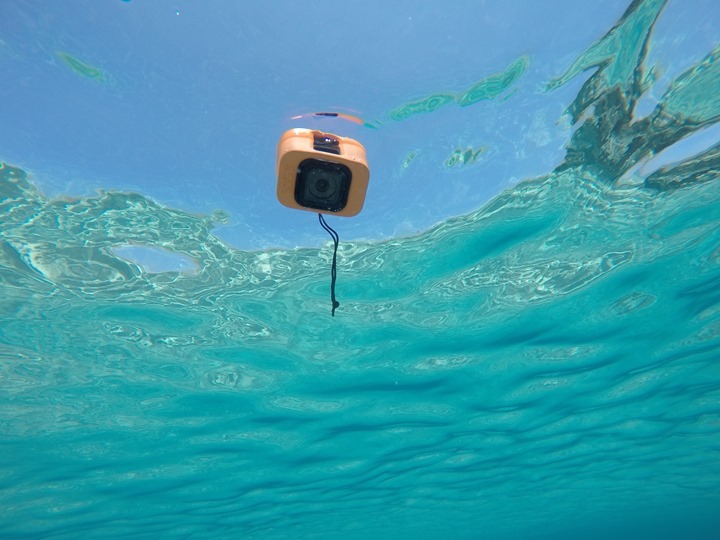 As with most action cameras that are designed to stand extreme weather elements and adventurous activities, this one too has a waterproof housing that works up to 131 feet deep. Among the most important pros that we have to single out in today’s review is the quality of the images you shoot with the GoPro Hero 4. The details are pretty spectacular, and so are the colors. The audio is also really great, and the camera does a good job even in situations where there isn’t that much light. Then, the 1.7-inch touchscreen LCD is definitely something that is worthy of our attention, and an important factor in deciding what kind of action camera to purchase. We should also mention the ProTune mode, which provides better control and quality, as well as an impressive range of peripherals, mounts, cases, and so on. Plus, all you need is the mobile app and WiFi in order to control the camera. Finally, another important pro is the fact that this camera is suited both for people who are more experienced with this kind of technology, and for people who are just getting started. While there aren’t many cons when it comes to the GoPro Hero 4, we should mention a couple of things that could be improved. For instance, in some cases, the photos and videos can come out looking a bit hazy. Moreover, the case tends to sometimes muffle the audio. Another thing that we’re not particularly excited about is the fact that the LCD panel is an optional extra. The camera wouldn’t be waterproof if it weren’t for the housing, and this is something that can bother some people. Finally, we should also mention the battery. First of all, you can’t use any of your old GoPro batteries for this camera. This means that you run the risk of being left with no battery to film something you’re interested in. For instance, just to give you an idea of how much battery life you should expect, let us tell you that if you shoot at 1080p 30fps, you only have around 100 minutes of footage before the battery dies. Overall, we are highly impressed by GoPro Hero 4’s quality, especially considering its affordable price. All the features it comes with, as well as the multiple accessories, make it one of the best action cameras on the market. It’s definitely better than the GoPro Hero 3+ Black, and we strongly recommend it to people who are looking for a compact device to help them capture their daily adventures.